For the ultimate in suspension performance for the 05-06 Super Duty Fabtech offers a bolt on 4 Link System that provides unsurpassed articulation and wheel travel. These heavy duty 2" diameter wall links feature race style 1" Uniballs for superior strength. Thick 1/4" steel brackets secure the 4 Links to the frame without cutting or welding. This 4 Link system allows the use of our replacement Coil Springs or our Dirt Logic adjustable Coilover Shock conversion. System also includes Billet Sway bar links, Trac Bar relocation bracket, Pitman Arm and more. 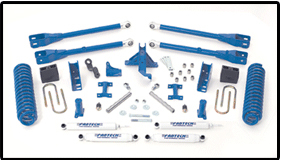 Rear lift options include a block and U-Bolt kit or replacement leaf springs.